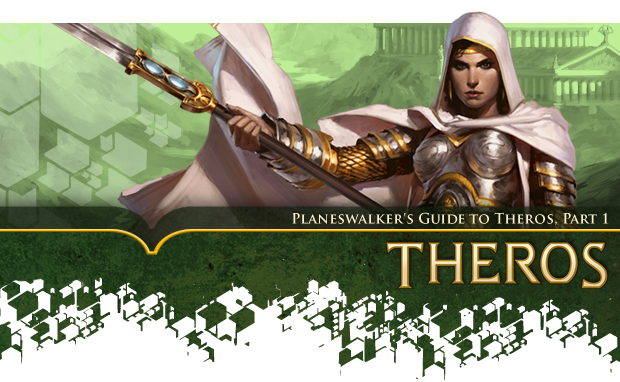 This is the first of three Planeswalker's Guides for the world of Theros and the eponymous first expansion set there. The caprice of the gods, the destined hero, the great journey, the untamed wilds beyond the city walls, the raging sea, the birth of civilization, temples and burnt offerings, hoplites and phalanxes, hydras, gorgons, minotaurs, sacred and profane rites and rituals, great thinkers, enlightened despots, revels in the woods, the power of belief—Theros is a plane filled with divine magic and monstrous danger, where heroes are born and where legends are made. 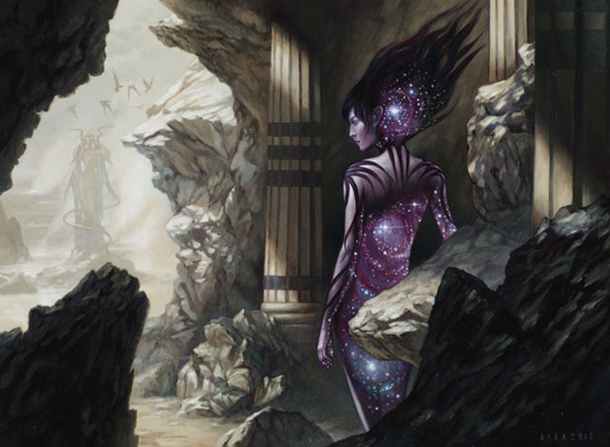 When mortals sleep and dream on Theros, they are said to "visit Nyx," the proverbial land of night and the home of the gods. Therefore, dreams are seen as gifts from the gods. When the gods appear to mortals, each is "infused" with Nyx itself. 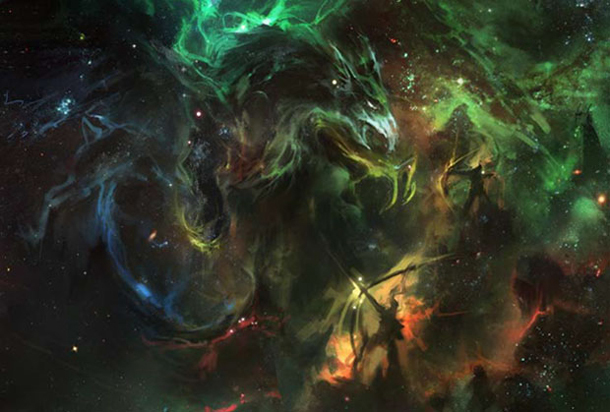 Where the god's features or form would be shadowed, instead the night sky is visible, as though the gods occupy the daylit world and the nighttime world at once. The gods themselves are living enchantments. 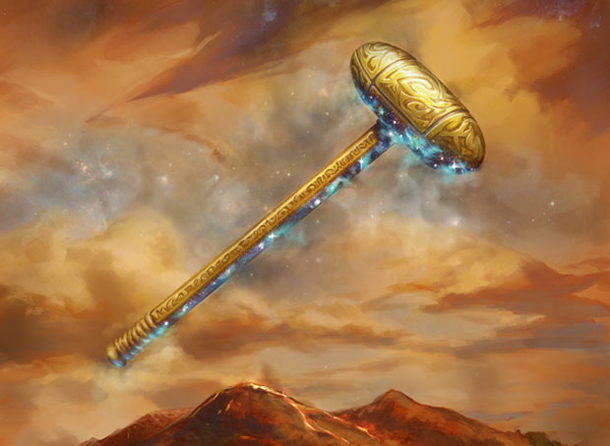 For this reason, all enchantments are thought to be gifts from the gods—a unique form of magic enabled by divinities. Additionally, when other creatures such as nymphs demonstrate the "infusion" of night sky that all the gods have in common, it's taken as evidence that the nymphs are servants of the gods, native to Nyx, and only visiting the sunlit, mortal world at the gods' behest. Countless generations of stories and faiths have led to a pantheon of gods that oversees the most important aspects of Theran life. Domains: Heliod represents law, justice, retribution, and the bonds of kinship. Heliod presides over matters of family honor, questions of morality and virtue, speeches, marriages, acts of protective bravery, dawn meals, and self-sacrifice. Heliod's name is often part of legal proceedings, and sacrifices to him are made in times when the greatest aid—or the strictest justice—is needed. 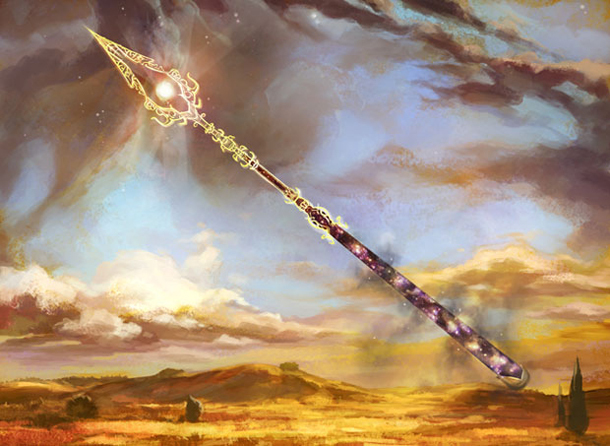 Signature item: Heliod wields Khrusor, the Sun Spear, a weapon blessed with his power that can be pitched down from the heavens to any point on Theros. Obscure legends say that another major polis once existed, a coastal city known as Arixmethes, that Heliod smote with Khrusor and cast into the sea. Personality: Heliod radiates with pride and self-assurance. His presence fills the sky with light, blocking mortal access to the dark, starry view of Nyx, and in person he has the same overwhelming aura of awe and brilliance. He is convivial and gregarious, making friends and forming bonds easily, and he sees himself as the ally to all. But others know that Heliod can be fickle in his loyalty. Heliod's greatest ally today might be the target of his retribution tomorrow. 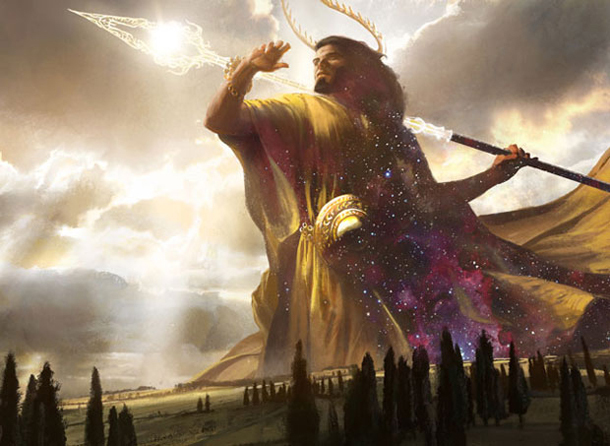 Worship: Heliod is the sun god, literally bringing the light of day to the world, so almost everyone on Theros pays at least tokenistic acknowledgment to him. Some families have a custom of winking in the direction of the dawn's light first thing in the morning, a gesture of respect to the sun god's luminous eye. Heliod's devoted worshippers are mainly humans and Laggona Band centaurs, who celebrate Heliod on the first clear-skied morning of every month. Temples to Heliod often feature stairs up to a rooftop courtyard, enabling sun worship. 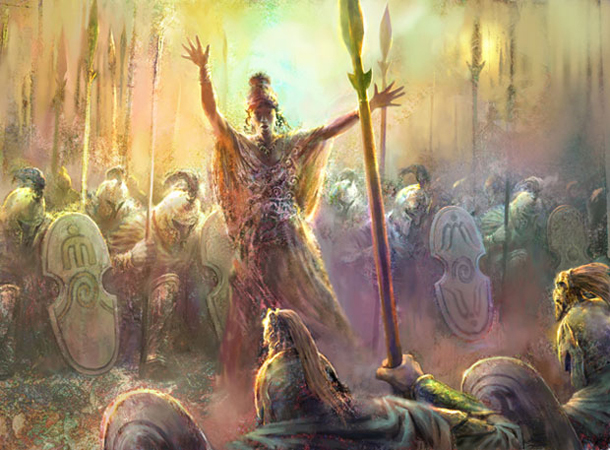 The largest holiday aligned with Heliod is the summer solstice, celebrated with three days of ceremonious feasting, weddings, and oaths of loyalty. 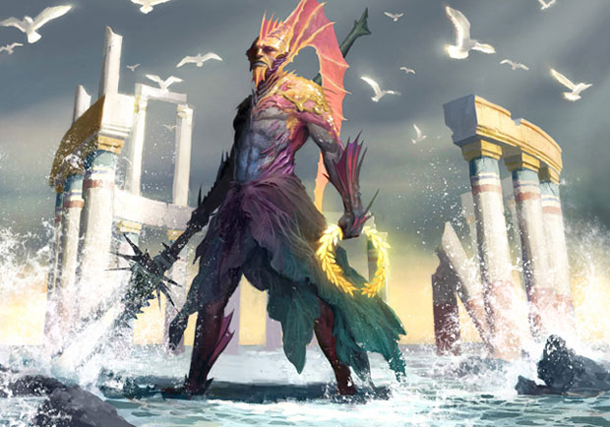 Domains: Thassa is the god of the sea and also presides over aquatic creatures and the secrets of the briny deep. But she is also the god of ancient knowledge, murmurs, gradual change, introspection, vast distances, long voyages, and far-ranging searches. Thassa might also be described as the god of patterns, such as those of tides, currents, ripples in water, and even the passage of time. 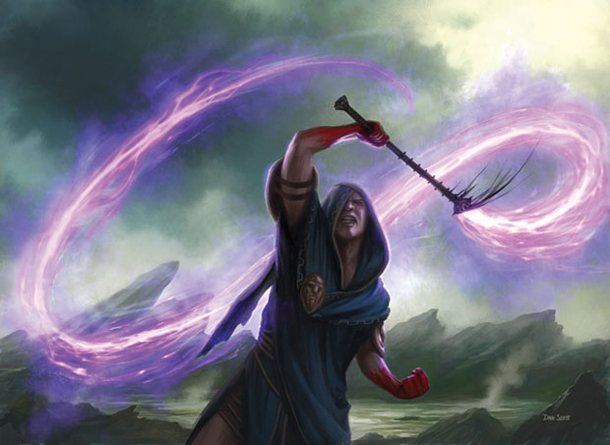 Signature item: Thassa wields Dekella, a two-pronged spear. Wielding Dekella allows her to control the tides and stir the seas into whirlpools. 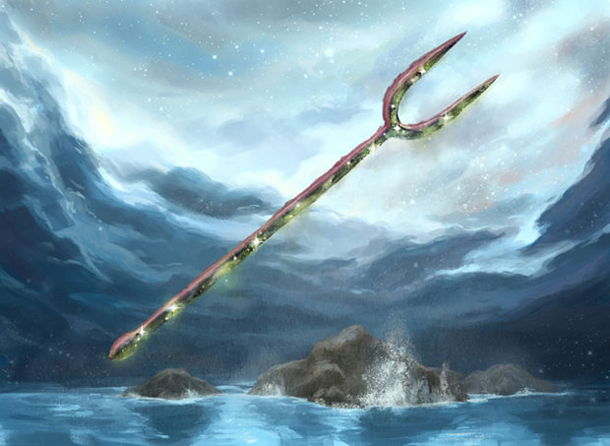 Legend has it that a mortal sailor once stole Dekella and used it to destroy an enemy fleet, and that Thassa punished the mortal by turning his entire family into eels. Personality: Thassa is the god who is least likely to be satisfied with the status quo, but also the least likely to rush to change. She is constantly striving to resculpt the land, changing coastlines and upending institutions for the purpose of slow, eventual, unfolding change. When she speaks, she often uses the future tense, always referring to what tomorrow will bring, forever uninterested with the reality of today. Thassa is slow to anger but implacable once roused. Her anger can grow like a rumbling, cresting, unstoppable wave, taking out whole villages with its fury—then subside with the tide, dragging the evidence of her wrath calmly out to sea. 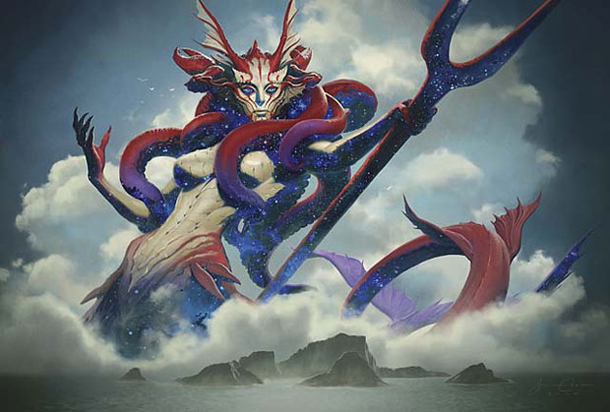 Worship: Tritons and the humans of Meletis comprise most of Thassa's worshippers, as well as all who venture out to sea, whether for exploration, commerce, or war. Although tritons exalt her above all other gods, she shows no favoritism toward them, seeming equally impassive to all mortals. She is worshipped with offerings of fish and salt by the poor, offerings of pearls and nacre by the rich, and with murmured prayers and quiet contemplation by all. When the sun first shone on Heliod, god of the sun, the first shadow was cast. 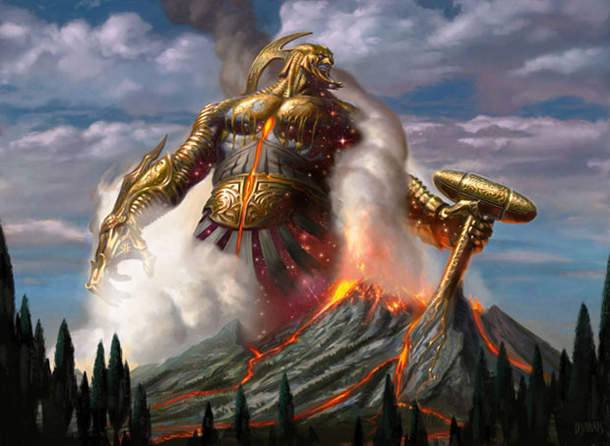 When Heliod saw it, he feared and banished it, sending it beyond the so-called Rivers That Ring the World, the five rivers that form a boundary between Theros and its Underworld. That shadow became Erebos, the god of death. In time, Erebos accepted his role, knowing that although Heliod had banished him, he would always stand behind the sun god. Domains: Erebos rules over death and the Underworld, but these aren't his only duties. Because of his own origins, he is also the god of misfortune, ill fate, begrudging acceptance, envy, and bitterness. And because he is lord of the Underworld, where gold is common and valueless, he is also the god of wealth. Although it might seem as though Erebos is connected to Nyx more closely than the other gods, this isn't the case. Erebos's realm lacks both the sun and the night. Signature item: Erebos wields Mastix, a golden-handled whip with an impossibly long lash, like a thin shadow that stretches on forever. The whip is a means of inflicting pain when he must, but its more frequent function is as a snare to pull the reluctant dead into—or back into—his realm. 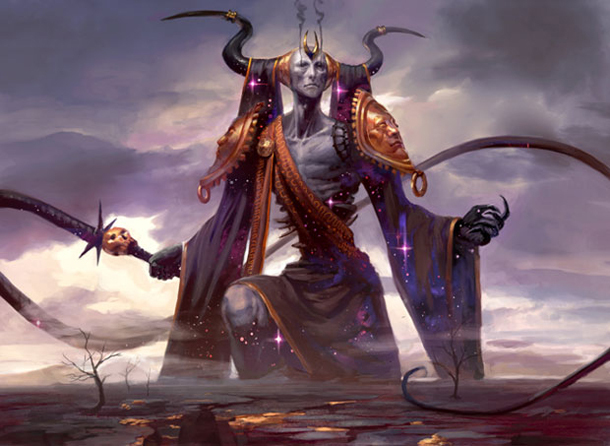 Personality: Erebos is an effective warden and lord of the Underworld realm. He is not without compassion, but his compassion is limited to feeling on behalf of others what he himself feels, and his acceptance of his fate means that his lieges, the dead, must accept theirs. He idly envies the sunlit world of the living, but only in a daydream-like way. He knows that all mortal souls will eventually join him, which affords him a kind of satisfaction and certainty. When others suffer, it brings Erebos peace, but not glee, because the alienation and banishment of others enables them to identify with his own. Worship: The god of the underworld is worshipped by three distinct sets of mortal beings: those who exalt death, those who desire wealth, and those who pray for acceptance of their fates. The first group is the smallest but most dangerous; they seek to bring about a confrontation between Heliod and his shadow. The second group is largest. Because the dead leave their earthly wealth behind, Erebos has become associated with that wealth, as well as with the abundance of (to him, pretty but valueless) gold in his realm. The final group is closest to Erebos's heart—those who have been cast out and who seek peace with their fate. 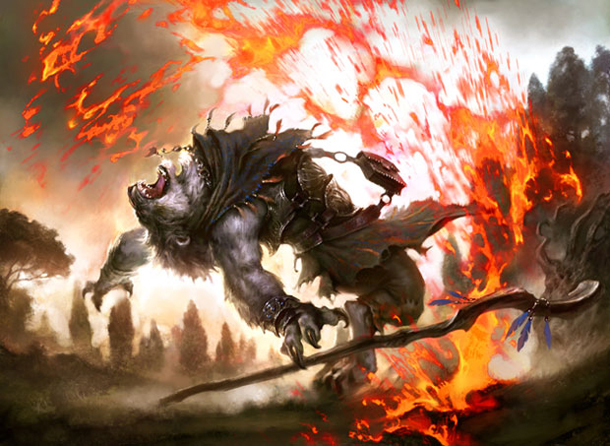 Domains: Purphoros is the god of the forge, the restless earth, and fire. He rules the raw creative force of heat and energy that fills the souls of sentient beings. His energy emerges as chaos, something to be harnessed and shaped by labor and passion. For this reason, Purphoros is also the god of artisans, of obsession, and of the cycle of creation and destruction. Signature item: Purphoros wields Akmon, a large hammer whose head slightly resembles an anvil. 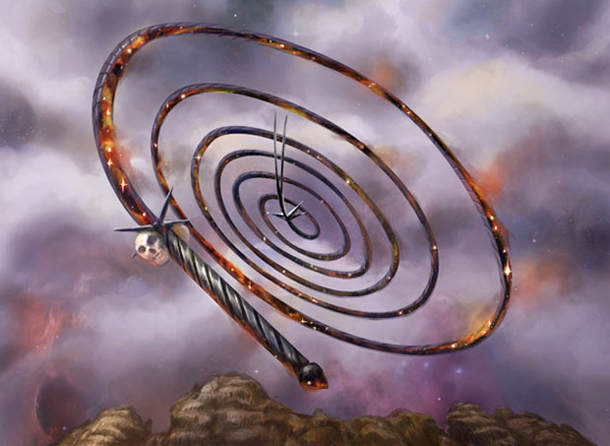 A blow from Akmon can render the earth molten, and when it strikes metal, each spark becomes a new enchantment, some of which even take on life. Personality: To sit in the presence of Purphoros is to be inspired. He forges the most ornate and delicate items only to dash them into flame and start again. He is reasonable yet ultimately follows no rules save his own creative and destructive impulses. Sometimes, this can mean covering a whole area with lava to make way for something new. His main flaw is that of frustration, of feeling limited and constrained. He is forever pushing against the barriers of mortal imagination, sensing that there is much more to express. This can cause him to plummet into despondency and then lash out at the world with raw destruction. 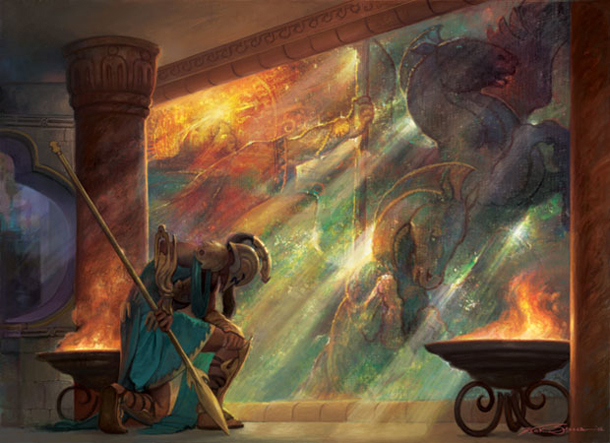 Worship: Followers of Purphoros, the god of the forge, brought the secret of bronze to Theros, leading to stronger objects and armaments than any created previously. And the most sanctified shamans of Purphoros also possess small quantities of a new metal said to have come from Purphoros's forge: iron. But it's not only smiths who worship him. Artists, human and satyr especially, seek his aid, ascending to altars on volcanic slopes to breathe deeply of the creative vapors. Warriors give him homage when lighting a bonfire. Potters inscribe their works with markings meant to honor him. 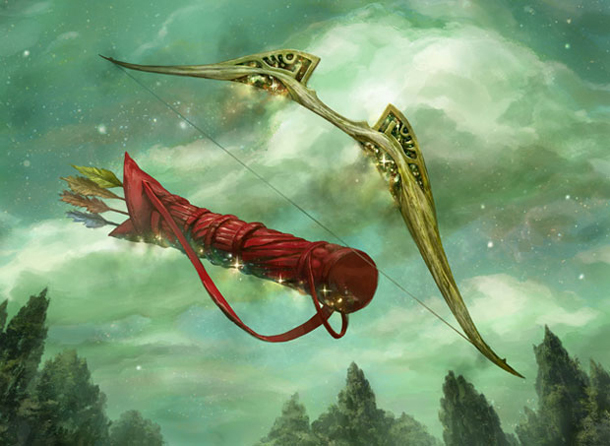 Domains: Nylea is the god of the hunt, the seasons, and the forest. Because of her reign over the hunt, she is also associated with predation and hunger. And because of her rule of the seasons, she is also the god of metamorphosis and rebirth. Nylea receives strength and peace from sleeping inside the chrysalis at the center of her grove. 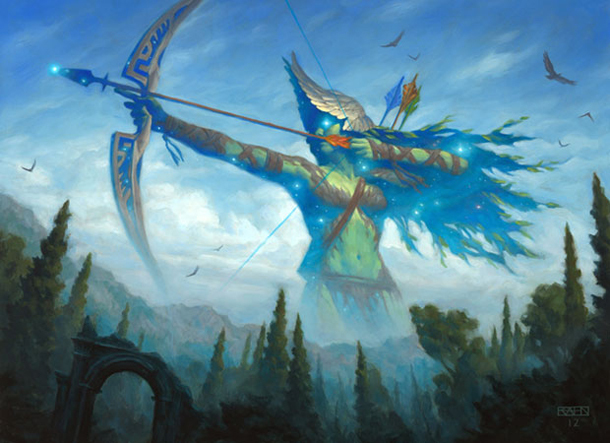 Signature item: Nylea is Theros's finest archer, and she wields a shortbow called Ephixis. Her companion, the nymph Theophila, conjures illusions for target practice, such as fireflies or miniscule silk worms. Nylea has no qualms with predation, but she loathes hunting for sport. She personally kills poachers in the Nistos Forest who have not asked for her blessing to hunt her animals. Personality: Nylea is usually aloof and thoughtful, but with her companions she is playful and joyful. She has a feral, animalistic side and shoulders the responsibility of keeping the forest a haven for animals, preventing the spread of humans into her domain, and letting the natural world have free rein. Nylea is quick to anger and vengeance if something threatens her realm. The seasons change at her whim, and she delays the change if angered. 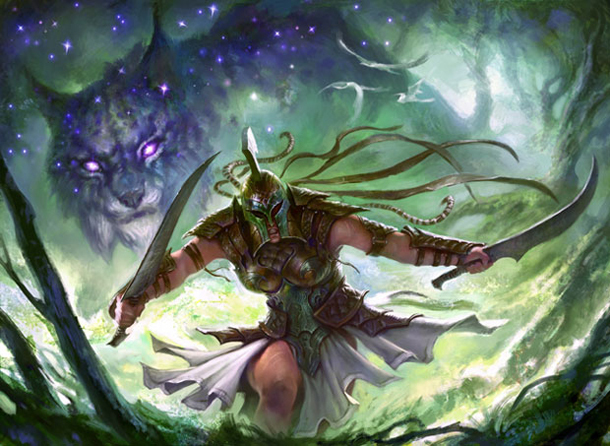 She is allied with Purphoros, and permits him to unleash fires on the forest when it is in need of cleansing or when humans are encroaching too far into the wilds. Nylea has a tumultuous relationship with Karametra, the god of the hearth. Karametra is infuriated by Nylea's interference in the seasons. In turn, Nylea is disgusted by agriculture, which she sees as an aberration from the natural cycle of the world. Worship: Nylea doesn't have temples built in her honor. She dislikes the construction of temples and cities in general. Nymphs of all kinds pay homage to her, as do sentient humanoids such as satyrs, centaurs, and many citizens of Setessa. Her holy sites often consist of a tree surrounded by a cloud of butterflies. When one of these trees is spotted, people say she is near. Her human followers tend to be loners, outcasts, and those who choose to live in the wilds. Some city dwellers will come into the forest to honor her, especially to pray that the seasons will change in a timely manner. Nylea hates sacrifices and is notoriously hard to please. Depending on their offerings, worshippers could as easily anger her as win her blessing. She enjoys seeing acts of kindness and protection of creatures both domesticated and wild. In Part 2, we will take a tour of the three major poleis—Meletis, Akros and Setessa. Until then, enjoyTheros!